When Cecil Higgins died in 1941, he had already made provisions for the foundation of a museum in his name. The collection he had been amassing over the previous ten years was stored in various places: the porcelain, glass and ceramics were in country houses to protect them from air raids, the silverware in Lloyds Bank (I assume to protect it from thieves) and other pieces, including furniture and ‘objects of vertu’ were in his house at Queen Ann Street, London. The entire contents of the house were catalogued from top to bottom, from morning room to the Maid’s room and marked either ‘M.E.’ for items exempted from Duty being of National, Historic and Artistic importance, ‘M’ for items for the proposed museum but not exempt from duty, or left blank (for example the ‘linoleum flooring’ listed as being in the cistern room which sadly didn’t make it into the gallery’s collection). I have been spending quite a lot of time trawling through this inventory over the last few weeks and in the ‘objects of vertu’ section I have found some lovely pieces. 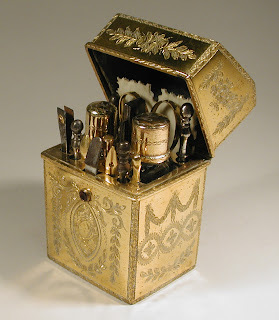 Marked as ‘M.E.’ is an oak box in which there is an embroidered rosewood casket, in which there is a collection of all manner of bronze and pinchbeck treasures from chatelaines to watches and snuff boxes to scent cases. But the first thing that is listed is ‘an elaborately fitted small nècessaire’ which I have chosen as this week’s object of the week. Nècessaires were designed, as their name suggests, to contain a range of ‘necessary’ accoutrements for women. This one includes items a lady might still use today, such as a writing tablet, tweezers, and bottles for various beauty potions, as well as more outdated items such as a spoon for earwax.